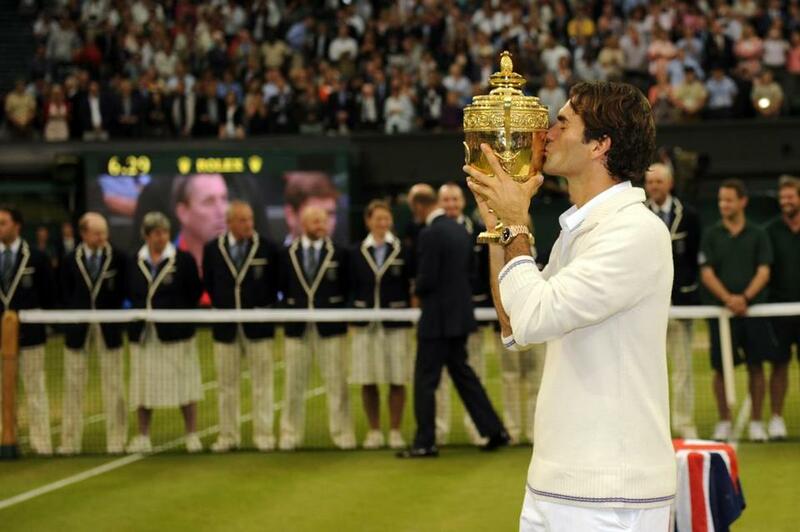 Roger Federer won his 17th major, seventh at Wimbledon. LONDON — Andy Murray attempted to make history here Sunday, but he first would have needed to make magic, to reach into the deep pocket of his tennis shorts, and conjure a cloud of smoke, or a spray of stars, and make Roger Federer disappear from Centre Court. Ah, such sweet, foolish fantasy. Not to be. It takes quite a bit more than sorcery, gimmickry, or a Vegas-lounge-like magic act to make Federer vanish in a London fog. The diabolical Swiss wizard, with his patented array of near-magical serves and shots and grass-court sorcery, again ruled supreme at Wimbledon, pinning a 4-6, 7-5, 6-3, 6-4 loss on Murray for a record-tying seventh Championships title at the All England Club. Murray’s synopsis was nearly as strong and accurate as his game, which on many days, in other Slam finals, would have been good enough to prevail. But not on July 8, 2012, with a chance to match British star Fred Perry’s win of 76 years gone by. Not with millions upon millions in the United Kingdom and beyond watching on TV and wanting it as much, if not more. Not with the 30-year-old Federer on the other side of the net, backed with 16 Grand Slam titles, including the half-dozen trophies with AELTC etched on their bases. Murray, 25, won the first set. He fell prey to some clever Federer cleptomania — legal, but downright torturous, Faginish — in the second set. And then it all turned in the third set, not long after rain forced the Centre Court’s roof to be closed for the first time in a final, soon after which Federer simply outlasted, outgutted, and outmaneuvered the big Scot in a 20-minute bruiser of a game. On serve at 2-3 in the key game, Murray bolted to a 40-0 lead in less than a minute. With the roof closed, the game, for both players, was now more predictable. If Murray could win this set, he would have a 2-1 lead, a decent if not dominating foundation built for glory. But 19 minutes later, after eight times reaching deuce, Federer pocketed the 4-2 lead. The play that dotted the agony came just before the breaker, when Murray fell to the turf for a second time in the game and failed to track down a deep lob. That close. That far. Had it still been raining, it would have been considered waterboarding. “It was tough, because both of us had chances,’’ said Murray, erased in the semis here the last three years. “There were break points and game points, obviously. I guess that was the longest game of the match. A tough game to lose. But you know, I wasn’t disappointed necessarily with the way I played in that game. Not really. Federer held to 5-2 in the next game, Murray chipped back one in the eighth game, and then the emboldened Federer (he needs more confidence like the Swiss need more chocolate) put the hammer down in ninth, winning to 40-30 on a long rally and closing out the set with an ace (one of his dozen on the day to Murray’s 16). There are no guaranteed bets, but Federer on Wimbledon grass with a 2-1 lead in sets is as close as slam gets to dunk. Everyone knew it, including Murray, the roof keeping the crazies out on Henman Hill from reaching him with their cheers of encouragement. The knockout punch came in the fourth game, Murray on serve, and Federer broke him on the first of two break points — a quick, efficient swipe of a cross-court backhand as the kill shot. “I tried to play more aggressive with the roof closed,’’ explained Federer, whose victory returned him to the top of the world rankings, tied him with Pete Sampras with seven Wimbledon wins, and also gave him his 17th Slam title. “When the wind is gone you get back more into tactics — you know what you can do, what you can’t do. The finish to the second set was also agonizing for Murray, who held serve at 5-6 and promptly took a 30-0 lead, only to lose the next four points . . . lose the set . . . lose his 1-0 lead in the match. The tidal surge that came his way by winning the opening set, his first ever in a Grand Slam final, suddenly washed back on him. The crucial game slipped to 30-30 when Murray went long with a forehand, then Federer clipped the next two points with masterful play at the net, scoring on drop volleys. Rather than entering a tiebreaker, with a chance to take a commanding 2-0 lead in sets, Murray ambled to the sideline in the disbelief of a 1-1 deadlock. Then came the rain early in the third set, a stop in play for 39 minutes that initially looked as if it might give Murray a beneficial breather. Instead, it took all the wind out of the building and put the match in Federer’s grasp. With the roof on, in fact, Federer won 11 of the next 17 games after previously winning 12, losing 12. The day was done, as was Murray’s date with destiny. Fred Perry in perpetuity. The UK remained a monarchy and not a Murrarchy. But, for the most part, the big kid from up north played well, and with grace. His agony was clear when, called on to say a few words on court after the loss, he needed time to compose himself. His disappointment was palpable. He may find the magic one day, but right now, it looks like it never will be easy for Andy Murray.